Rhino-Tuff Mobile Chart Racks - 5 Year Guarantee! Our exclusive line of Rhino-Tuff mobile chart racks are backed by our industry leading 5-year guarantee! Designed for high-impact applications, our Rhino Tuff carts are the perfect solution for hospitals and medical facilities requiring a mobile chart rack that is built to last. Features include welded steel frames, organizers and cap shelf for additional storage. Extra large 4" silent rubber rolling casters (2 locking) are supplied to ensure a quiet ride when making rounds. This chart rack is shipped fully assembled. SKU # RTCR-0013, Heavy-Duty Mobile Cart Rack - 5 Year Guarantee! SKU # RTCR-1548, Heavy-Duty Mobile Cart Rack, Cabinet Style - 5 Year Guarantee! SKU # RTCR-0120, Heavy-Duty Mobile Cart Rack, Cabinet Style - 5 Year Guarantee! SKU # RTCR-0140, Heavy-Duty Mobile Cart Rack, Cabinet Style - 5 Year Guarantee! SKU # RTCR-0135, Heavy-Duty Mobile Cart Rack, Cabinet Style - 5 Year Guarantee! SKU # RTCR-1516, Heavy-Duty Mobile Cart Rack, Cabinet Style - 5 Year Guarantee! SKU # RTCR-0004, Heavy-Duty Mobile Cart Rack - 5 Year Guarantee! SKU # RTCR-0002, Heavy-Duty Mobile Cart Rack - 5 Year Guarantee! SKU # RTCR-1536, Heavy-Duty Mobile Cart Rack, Cabinet Style - 5 Year Guarantee! SKU # RTCR-0014, Heavy-Duty Mobile Cart Rack - 5 Year Guarantee! SKU # RTCR-1324, Heavy-Duty Mobile Cart Rack, Cabinet Style - 5 Year Guarantee! 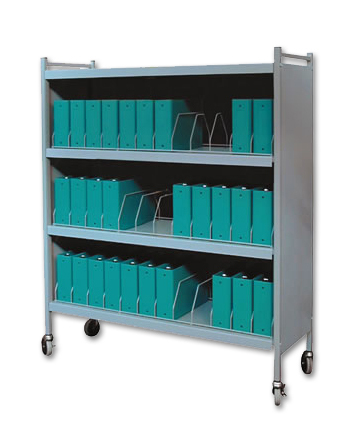 Deluxe Extra Large Binder Cart, Holds 4" & 5" binders! SKU # RTCR-0009, Heavy-Duty Mobile Cart Rack - 5 Year Guarantee!